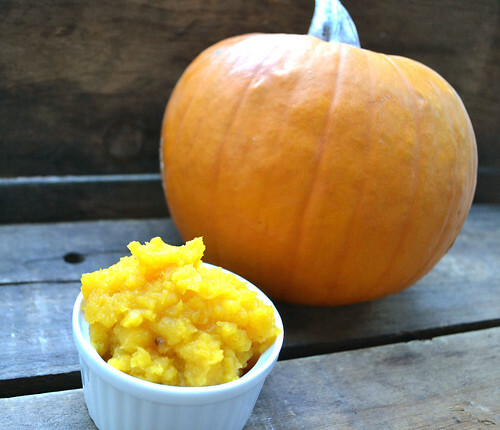 There's nothing like fresh roasted pumpkin puree for baking and cooking, especially during the holiday season. Follow these step-by-step instructions to enjoy fresh puree in your breads, cookies, and pies in no time. 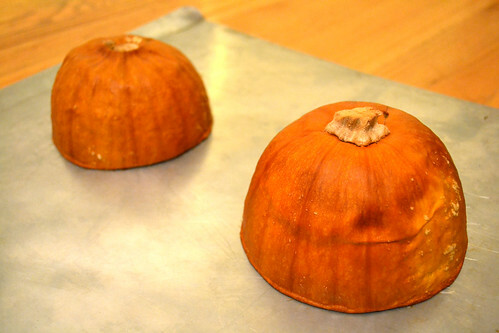 1-3 sugar pie pumpkins (you can roast more, but six halves -- three pumpkins -- will fit on most baking sheets). Preheat the oven to 375 degrees Fahrenheit. 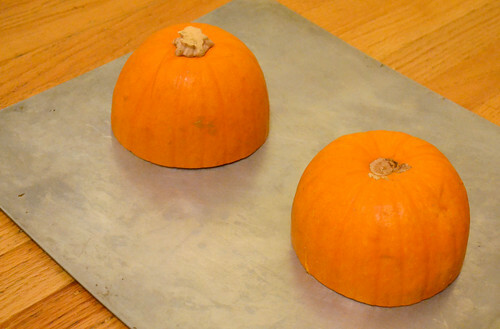 Cut your sugar pie pumpkin(s) in half and scoop out the seeds. Arrange the halves cut-side down on your baking sheet. Roast for approximately one hour, until a knife easily pierces the flesh. 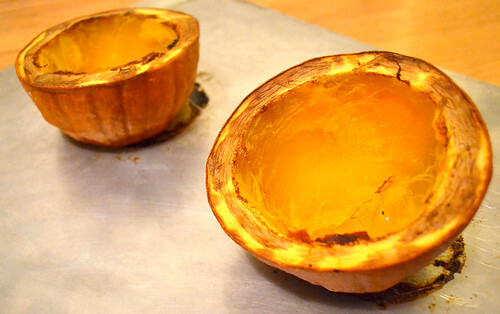 The inside of the pumpkin should be orange-ish in color and relatively easy to scoop out with a spoon (if not, just put them back in for a few more minutes). If you prefer a smooth puree, blend the scooped out flesh in a blender, with a hand blender or with a food mill. 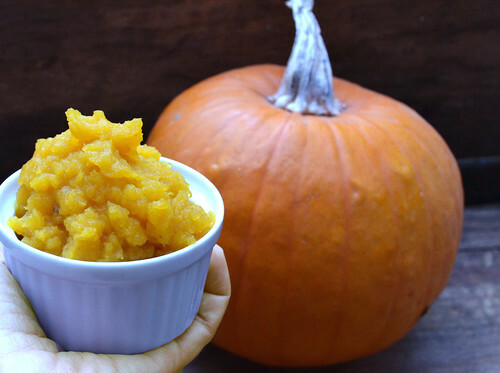 Use this puree to make our easy Homemade Pumpkin Bread, Vegan Pumpkin Ice Cream, or a Homemade Pumpkin Spice Latte. How To Add Sugar Pie Pumpkins To Your Delivery: CSA members - head on over to our online Farm Stand Market to customize your upcoming delivery. On the second page of customizations, you’ll find “Produce by the Case” and can stock up on sugar pie pumpkins if you want. The Market is open from noon on Thursday until 10 am, 2 days before your scheduled delivery day. After you confirm your produce items, click the orange button "Confirm and Continue To Other Farm Products" to add the products to your delivery. One of the best parts about squash season is roasted seeds. They make such a great snack and are a good source for protein, calcium and zinc. 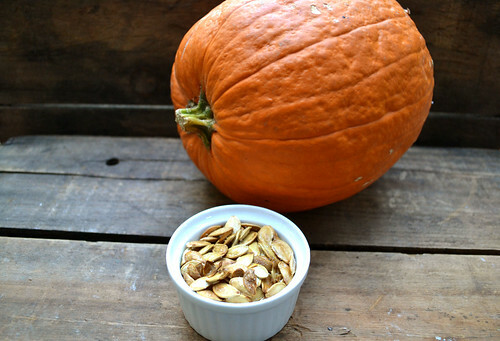 We love roasting all of our squash seeds, not just pumpkin. The most important step to getting crispy, crunchy seeds is to make sure they are completely dry. Lay them out on a towel and let them dry completely, a few hours or even overnight. You can save the dry seeds for a few weeks before roasting if you decide to save a large batch. The delicata seeds are so small and fun to eat. 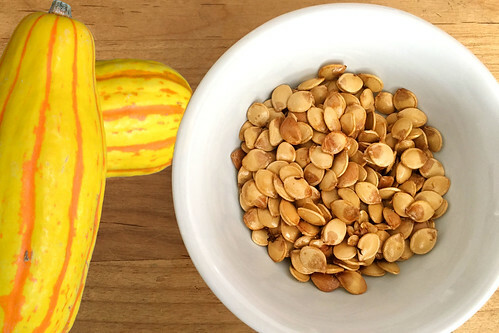 We like to stockpile our delicata seeds so we have a larger batch to roast (we typically roast seeds from 2-3 delicata squashes at a time). Salt and any of your favorite herbs (we used Omnivore salt on one batch, but rosemary, garlic and cayenne would be good too!). Preheat the oven to 325 degrees Fahrenheit. Drizzle olive oil over the seeds and stir to coat. Sprinkle with salt and any other seasonings you desire. Roast for 15-20 minutes (or until golden brown), stirring a few times while cooking to ensure evenness. Preheat the oven to 400 degrees Fahrenheit. Drizzle olive oil over the seeds and stir to coat. Sprinkle with salt and any other seasonings you desire. Roast for 15-20 minutes (or until golden brown), stirring a few times while cooking to ensure evenness. 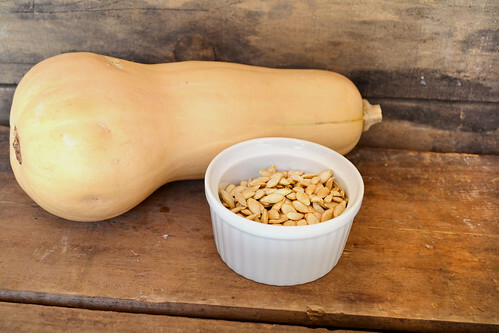 How To Add Squashes To Your Delivery: CSA members - head on over to our online Farm Stand Market to customize your upcoming delivery. On the second page of customizations, you’ll find “Produce by the Case” and can stock up if you want a big batch of squashes. The Market is open from noon on Thursday until 10 am, 2 days before your scheduled delivery day. After you confirm your produce items, click the orange button "Confirm and Continue To Other Farm Products" to add the products to your delivery. We are more than halfway through October Unprocessed and I think we could all use a little seasonal inspiration from one of our favorite go-to bloggers to kick our weekly menus up a notch. 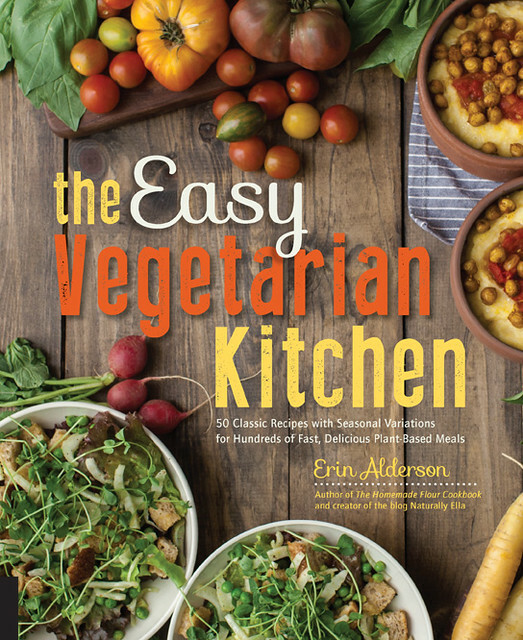 We always want to pass along our best finds to our extended farm family and Erin Alderson’s newest cookbook, The Easy Vegetarian Kitchen, should definitely be on your list. 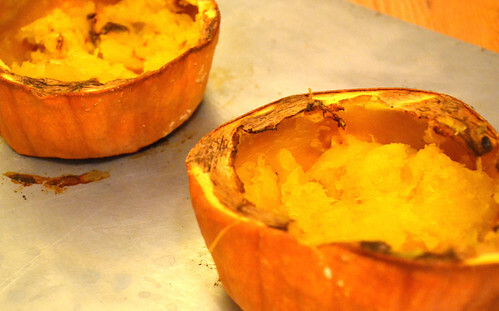 Erin shows just how simple it is to make vegetarian recipes adaptable to what’s in season now. Featuring recipes for every time of day, The Easy Vegetarian Cookbook starts with essential recipes that are everyone’s favorite staples (egg skillets, risotto, pizza) and then trades out the ingredients to create seasonal alternatives. This recipe style simplifies the cooking process without feeling limited by just one option. 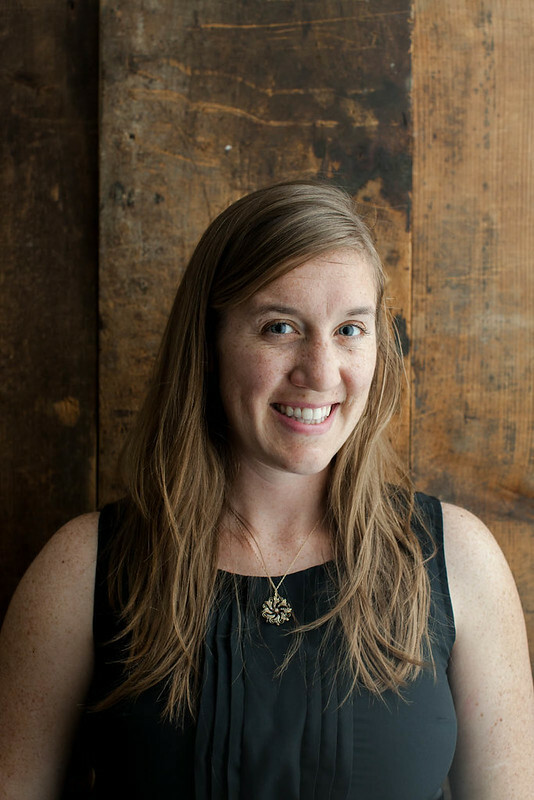 Erin is the blogger, photographer and web designer behind the modern foodie blog Naturally Ella. Erin started blogging on a whim in 2007 as a healthy baking blog but has since grown into a thriving seasonal, whole foods resource site. She grew up in a traditional middle class family that had a diet largely reliant on fast food. Five years ago Erin’s father suffered a massive heart attack leaving Erin to question her own health and eating habits. Since then, she has ditched processed foods in lieu of whole foods. Erin is a large proponent of local agriculture and seasonal eating which has become a large part of the Naturally Ella philosophy. We’re guessing that a charming recipe book that highlights fall’s most desirable ingredients might just inspire you to keep strong and unprocess on into the New Year. Congratulations to our winner JanO!! What is your favorite fall recipe and why? No purchase required. Limit one entry per person, please. Entries will close at noon on Tuesday, November 3, 2015. Winners are chosen by Random Number Generator and will be announced on our blog, Tuesday, November 3, 2015. Preheat the oven to 375˚F (190˚C, or gas mark 5) and cover a baking tray with parchment paper. To make the crust: In a food processor or large bowl, combine the flour and salt. Cut in the butter and cream cheese, pulsing in a food processor or using your fingers until the dough is in pea-size pieces. Add the maple syrup and water, pulsing or stirring until the dough comes together. Turn out onto a floured work surface and roll the dough into a 10-inch (25 cm) circle. Transfer to the baking tray. To make the filling: In a bowl, whip together the ricotta, honey, black pepper, and sea salt. Spread the ricotta over the crust, leaving an edge of roughly 1½ inches (3.8 cm). 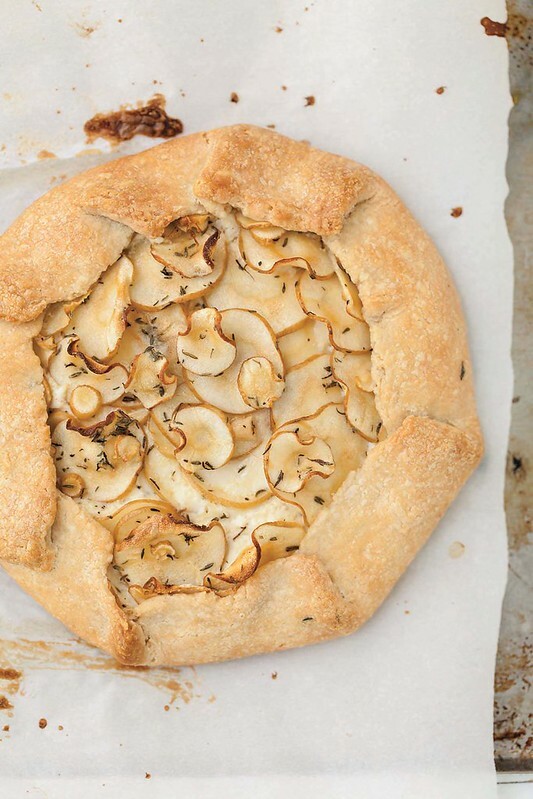 Toss the shaved parsnip with the melted butter and thyme and layer on the galette, and fold the edges of the crust over the outer edges of the layered ricotta and vegetables, pleating the crust as you go in order to make an even circle. 45 minutes, until the crust is golden and the filling is set and bubbling. Remove from the oven and let cool before serving. Store leftovers in an airtight container in the refrigerator for 3 to 4 days. Oh, pomegranates. We love you so much, but why are you so difficult to eat? 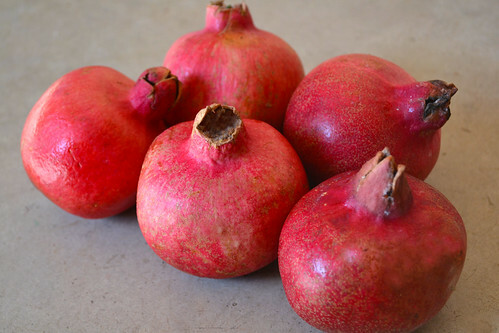 Don't worry, we've figured out three easy ways to get the seeds - or arils - out of the pomegranates so you'll be enjoying them in no time. 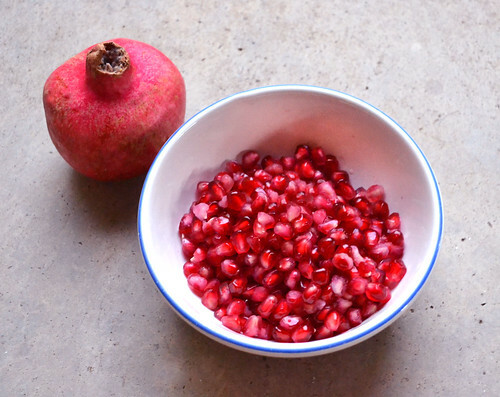 Before starting, be sure to wash the outside of your pomegranate thoroughly. 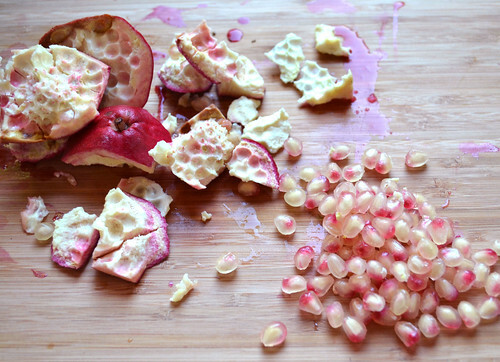 Pomegranate juice stains, so this method is one of the least messy. Fill a large bowl with water. Score the pomegranate into quarters. 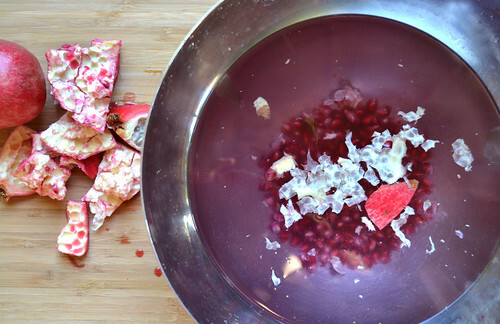 Plunge the pomegranate under the water and gently pull apart the skin then nudge the seeds out. The arils will sink to the bottom of the bowl and the skin and pulp will float to the top of the water. When you've gotten all the seeds out, skim out the pulp and compost. Drain the water and seeds into a colander and pick out any remaining pulp bits. Enjoy! 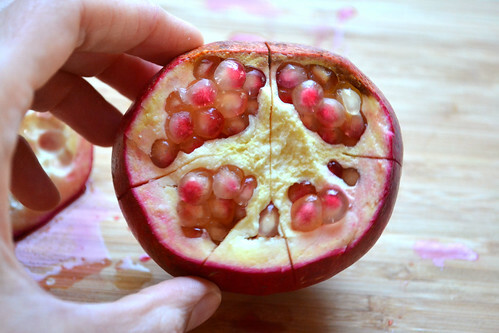 Cut the pomegranate into halves or quarters. 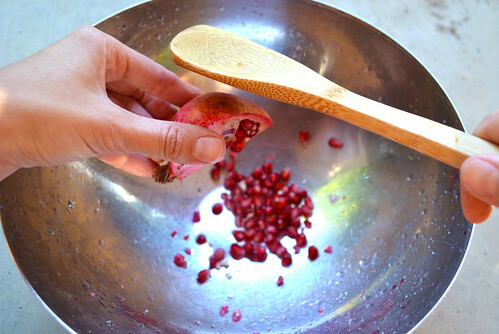 Holding the pomegranate over a large bowl, seed side down, whack the back of the pomegranate firmly with a wooden spoon. All of the seeds will just fall into the bowl. Repeat with the remaining quarters, picking out pulp when necessary. With this method, you have to be precise in your cutting which can be tricky. 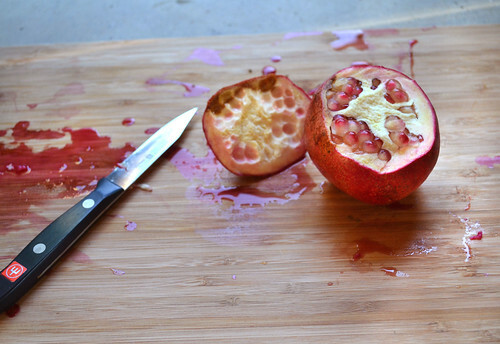 Begin by carefully slicing off the top of the pomegranate (about a quarter inch from the top). 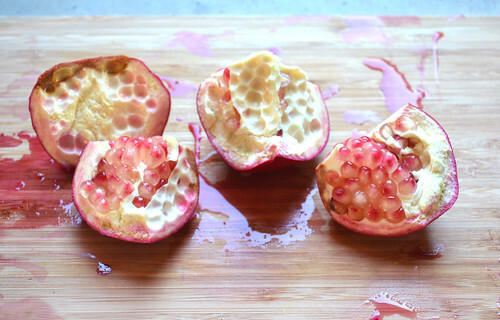 Next, score the skin of the pomegranate. Only cut through until you hit the white parts so you don't cut into the seeds and make a mess. Use the white ridges - the natural "pockets" separating the seeds - as your guide (as shown above). Gently pull the wedges apart and use your fingers to nudge out the seeds. 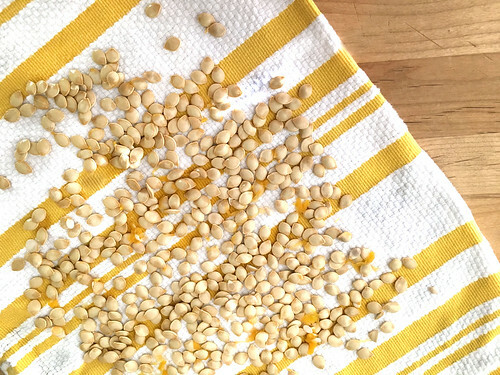 Because you cut around the pulp, the seeds should mostly be all exposed for easy seed collecting, without having to pick out as much pulp as the other two methods above. Get your pom-pom on! You can enjoy them as a snack, add them to drinks or smoothies, top salads or yogurt, or even toss them in your pancake batter. What's your favorite way to use them? How To Add Pomegranates To Your Delivery: CSA members - head on over to our online Farm Stand Market to customize your upcoming delivery. On the second page of customizations, you’ll find “Produce by the Case” and can stock up if you want a big batch of pomegranates. The Market is open from noon on Thursday until 10 am, 2 days before your scheduled delivery day. After you confirm your produce items, click the orange button "Confirm and Continue To Other Farm Products" to add the products to your delivery. 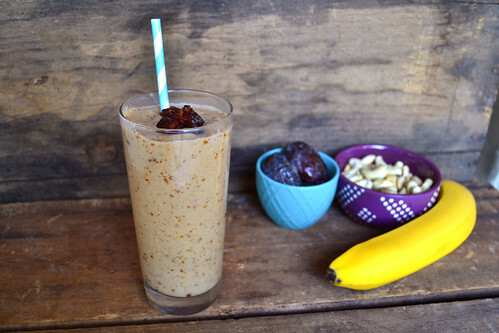 Have you guys ever tried dates in your smoothies (or other dishes)? We love how sweet yet healthy they are. 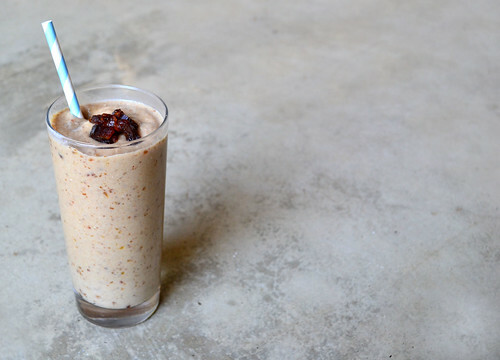 This smoothie feels like such a treat, but is so good for you and super satisfying. Feel free to substitute your favorite non-dairy milk with this recipe -- we think almond milk would be especially good with the cashews. Place all the ingredients in a blender or food processor and mix until well combined. Enjoy! 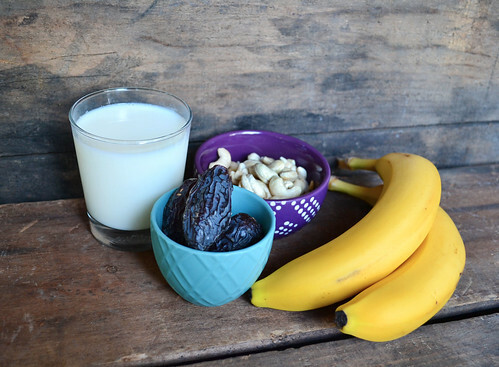 How To Add Bananas and Dates To Your Delivery: CSA members - head on over to our online Farm Stand Market to customize your upcoming delivery. On the second page of customizations, you’ll find “Produce by the Case” and can stock up if you want a larger batch of produce for juices and smoothies. The Market is open from noon on Thursday until 10 am, 2 days before your scheduled delivery day. After you confirm your produce items, click the orange button "Confirm and Continue To Other Farm Products" to add the products to your delivery. 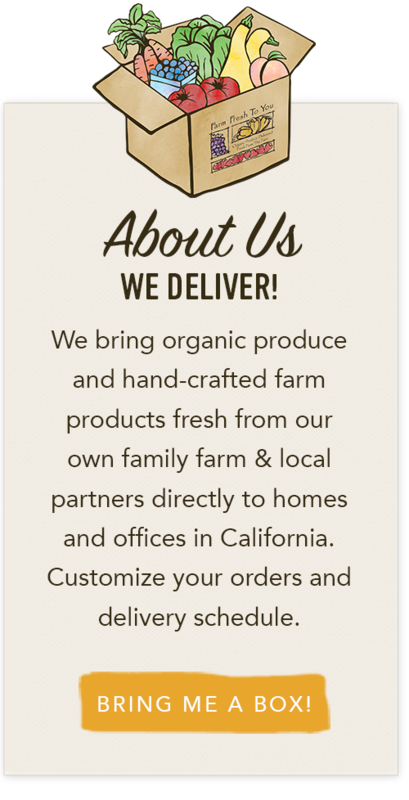 You'll find the dates on the second page, "Other Farm Products," and can add it to your delivery. The implacable heat, the relentless length of day light hours, autumnal equinox and winter squash — signals my favorite seasonal change. Before owning and operating Suzie’s Farm, I always wanted to grow autumn pumpkins at home, but failed to plan correctly. Labor Day was about the time it occurred to me to plant the prodigious varieties. I was sure they would be ready in October. I was dismayed to find that they required between 80-120 days to reach harvest. 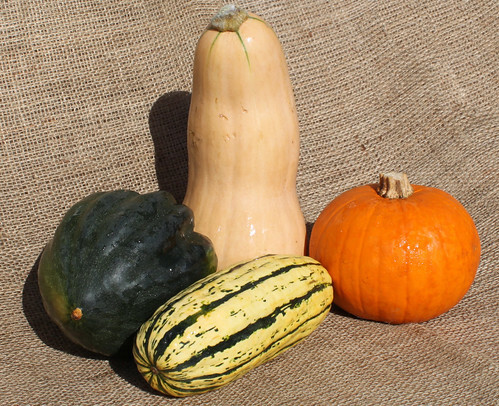 Deceived by the term “winter squash,” I endured an utter betrayal. Winter squash, I would laugh bitterly to myself, grown in the summer. Nothing seemed crueler to this amateur gardener. I contented myself with purchasing a multitude of varieties at grocery stores, captivated by the grey knobby ones, the smooth white ones, the ridged calico ones, and the squat coral ones, clearly envisioning the day I would grow my own. Our First “Pumpkin Palooza” was six years ago and hardly a “wild and crazy extravaganza as defined by Webster’s Dictionary. We had moved from our scant three acres on the original Suzie’s Farm property to a much larger, to us, 40-acre property on July 6, 2009. We were still growing in our awareness of how to farm. Truly, we had no idea what we were doing. It was early October, and we had acres of beautiful pumpkins; my vision manifested — acres of pumpkins, and a tiny CSA subscription. We wrote about U-pick pumpkins in our small newsletter and on my personal Facebook page. We ran our first batch of Suzie’s Farm t-shirts to sell. I personally called friends and family and invited them to come. I offered tours of the property. I asked our Office Manager to make her legendary champurrado and hauled down to the local panaderia to extend refreshments. It was our first public event, and I was excited. The hay bales became the first game of climbing. The girls snarled and curled around the fruit. Wheelbarrows fascinated. My awareness was unlocked. Friends and family arrived and marveled at the size, at the scope, at the production, at the beauty. I surveyed the 40-acres, bound by a fence along the North and East, and trees and a berm to the South and West, stretched out my hand and replied, “Anywhere you want!” Not knowing what to do with such freedom, we started out on a tour. And this is when I knew that our farm is about so much more than the vegetables. And, so, I heartily invite you to our 6th Annual Pumpkin Palooza, on October 17, 2015. The sunsets have been surreal. They melt on the horizon into a passion of colors that grow in intensity before fading into the evening. Purples and pinks are the main colors. Clouds provide a thin blanket across the sky that reflect the colors and add texture to the evening making it the best sight of the day. The days are still warm, hitting the 90s and sometime triple digits for an hour or so, but the evenings cool off and the mornings are chilly enough to warrant a light sweater. There was a bit of rain last night. The day was warm, and the sky was filled with a few huge clouds that didn’t even cover half of the sky. I stared at the clouds for a while, thinking they looked like rain, but convinced myself it wasn’t going to happen because they were missing their usual gray color, and there just wasn’t enough of them. We were at neighboring farm Full Belly for their annual Hoes Down festival. Once darkness settled in across the farm, a few drops came. At first, it was nothing and then the farm was overcome with the pitter-patter of raindrops on metal roofs. We ducked under one of them. The people on the dance floor mostly scattered, but some remained, hooting and rejoicing over the first rain of the season. As quickly as it came, it left. The next morning, I walked around our farm. The dust was settled, and the smell of wet dirt was is my soul. The fall crops of kales, chards, carrots, beets, lettuces, bok choy and radishes looked especially fresh. Their leaves were washed of any dust, and I think their spirits were lifted with the water. Under the Mother Oak by the creek, a group of deer stood picking up the acorns that had fallen. They didn’t seem too bothered by my presence. Turkeys, quail and doves were all out enjoying the morning. Beyond the farm, the dry grass on the hills looked a little more worn from the weather. The oak trees were still holding on to the green color in the leaves, but it will be only a matter of weeks before they turn brown with the season. All of our summer crops are done. The fields that were the home to the melons, tomatoes, eggplants and peppers are now bare dirt and ready for a seeding of cover crop that will be germinated with the rains that we all hope continue to come. Yolo Arts Community Art Project & Giveaway! This summer, we met with Yolo Arts to discuss a possible sponsorship for their Art Farm Harvest Gala on November 6, 2015. During our brainstorming session, we dreamed up an idea we were able to bring to life and it turned out to be an amazing project! We all wanted the project to be something everyone could participate in – adults and kids, and we also wanted it to reflect the farm-to-table movement. What if Yolo Arts brought an artist to our Capay Crush Festival and created an art project to auction off at their event? Better still, what if we involved the community in the creation of this art piece on site at the festival? We unanimously decided we had to do this project! 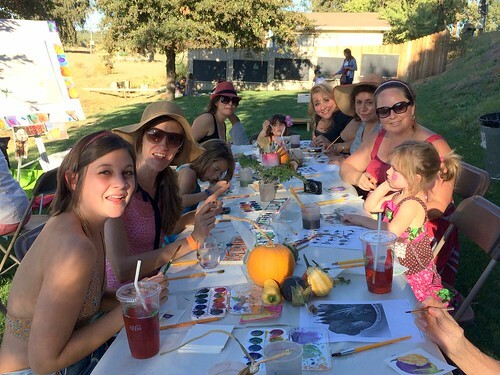 Yolo Arts commissioned artists Laura Hanke and Kaye Gamper to join us at our Capay Crush Festival on the farm on September 19th and the activity was set! 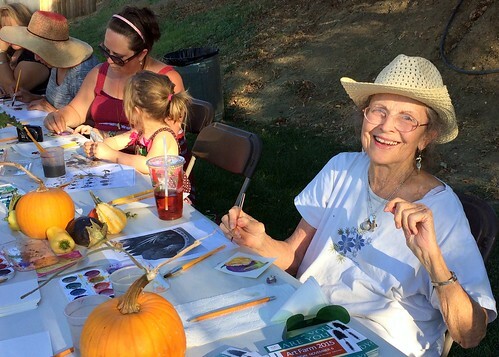 On the day of the event, Yolo Arts Special Projects director Janice Purnell arrived with paper and paints and set up on a long table next to a field of pumpkins and gourds. Artist Kaye Gamper brought two amazing sketches depicting farms and a bountiful table of produce. 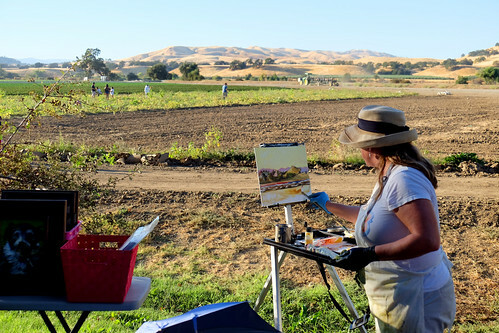 Laura Hanke set up her easel facing the golden hills of Capay Valley. 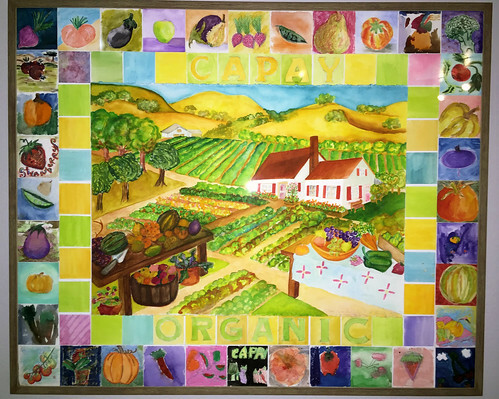 Farm visitors of all ages filled the painting table to create the community piece’s border of fruits and vegetables. It was a peaceful, reflective activity in the shade of the oak trees. 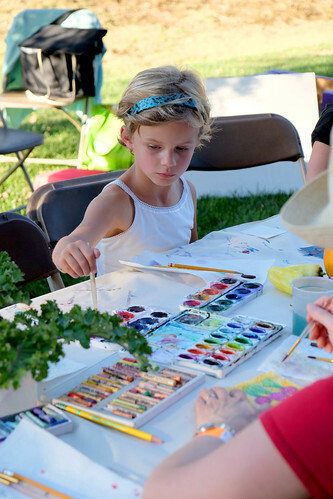 Amateur artists were feeling joyful and relaxed at the opportunity to sit and paint en plein-air. 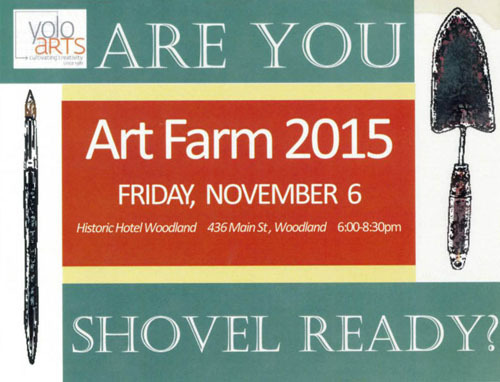 Farm Fresh To You is sponsoring the Art Farm Harvest Gala on November 6th. Proceeds raised by the Gala are used to support Yolo Arts’ Art & Ag program, the Yolo Land Trust and Yolo Farm to Fork.Yolo Farm to Fork is a partner of Yolo Arts and participates each year in the Art & Ag Project, which cultivates a dialogue between artists, farmers, and the community to raise awareness of the importance of preserving farmlands and the visual arts in Yolo County. We have two tickets to give away! If you’re in northern California, and you'd like the opportunity to see more farm art on November 6th at Yolo Arts’ 8th Annual Art Farm Gala in Woodland, California, leave a comment below. Congratulations to Kristen our winner chosen at random for our Giveaway! What is your favorite local farmscape? No purchase required. Limit one entry per person, please. Entries will close on Monday, October 19th, at 8:00 am. Winners are chosen by Random Number Generator and announced on our blog on Monday, October 19th. To purchase tickets to the Art Farm Harvest Gala visit yoloarts.org/box-office or call 530-309-6464. We are celebrating the new season with a pancake-palooza! Make time for a comforting fall meal featuring some of the season's favorite flavors - apples, spiced pears, maple syrup, savory squash and sweet potatoes. Invite your friends over for a brunch and try all four, or pick your favorite for a cozy, lazy Sunday breakfast, lunch or dinner. They all have such unique flavors, you'll want to try them all! 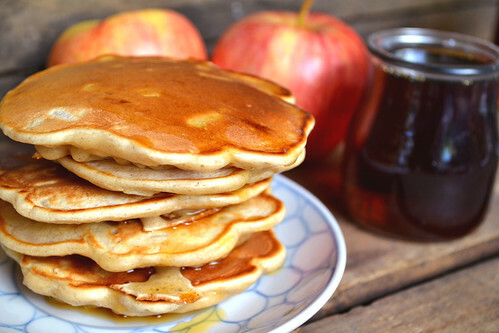 We love the slightly tart flavor and delicate crunch of the apple in these pancakes. Beat the eggs, vanilla and milk together in a small bowl until combined. In a large mixing bowl, whisk the sugar, cinnamon, flour, salt and baking powder. Pour the wet ingredients into the dry ingredients and stir to combine. Stir in the apples until well distributed in the batter. Heat a large saute pan over medium-low heat. If using a nonstick skillet, no oil or butter is needed. Otherwise, melt a pat of butter in the pan and swirl to coat. Using a 1/3 cup as a measurement tool, place three dollops of pancake batter in the pan. Let them cook until they start to bubble on top, then flip and cook a few minutes more, until golden brown. Enjoy! 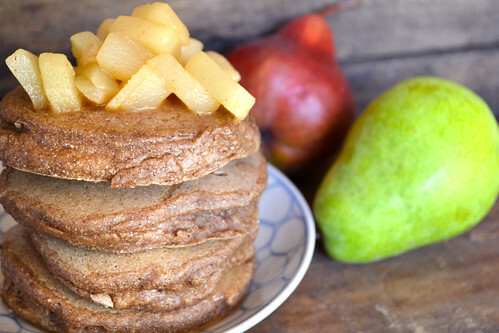 These barley pancakes are super filling and match up well with the pear compote. Peel, core and chop the pears. Place them in a small saucepan with the apple juice, cinnamon, nutmeg and butter. Cook them over medium heat for 15 minutes, stirring occasionally. Set aside to cool while you make the pancakes. In a large mixing bowl, whisk the flour, baking powder and salt. In a smaller bowl, beat the egg, maple syrup, oil and milk together. Stir the wet ingredients into the dry ingredients until just combined. Heat a large saute pan over medium-low heat. If using a nonstick pan, no oil or butter is needed. Otherwise, melt a pat of butter in the pan and swirl to coat. Using a 1/3 cup as a measuring spoon, place three dollops of pancake batter in the pan. Let them cook until they start to bubble on top, then flip and cook a few minutes more, until golden brown. These pancakes are kind of thick, so be patient to make sure they are thoroughly cooked before flipping. 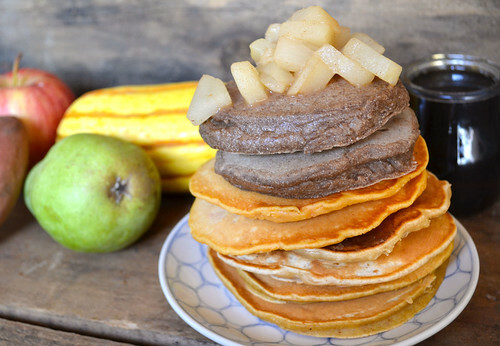 Top the pancakes with the pear compote and dig in! 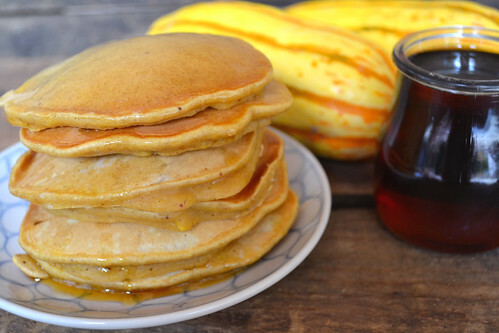 Click here to get our Delicata Squash Pancake Recipe. 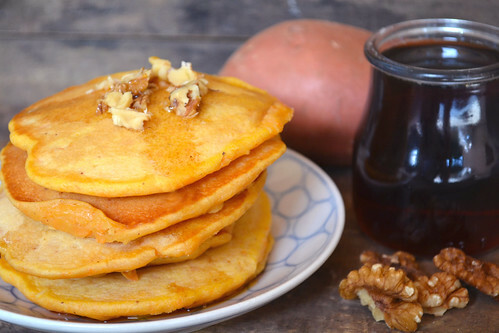 Click here to get our Sweet Potato and Walnut Pancake Recipe. How To Pancake Ingredients To Your Delivery: CSA members - head on over to our online Farm Stand Market to customize your upcoming delivery. On the second page of customizations, you’ll find “Produce by the Case” and can stock up if you want a larger batch of produce for juices and smoothies. The Market is open from noon on Thursday until 10 am, 2 days before your scheduled delivery day. After you confirm your produce items, click the orange button "Confirm and Continue To Other Farm Products" to add the products to your delivery. 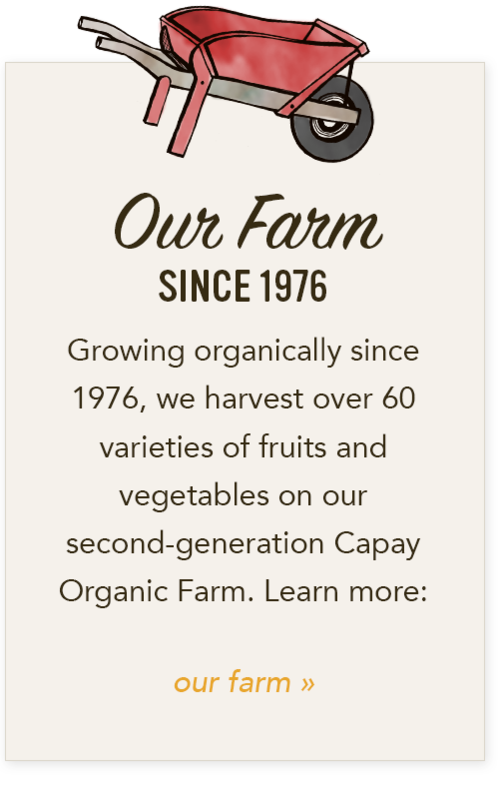 You'll find the Solana Gold apple juice, Mead maple syrup and Full Belly's purple barley flour on the second page, "Other Farm Products," and can add them to your delivery if you choose. 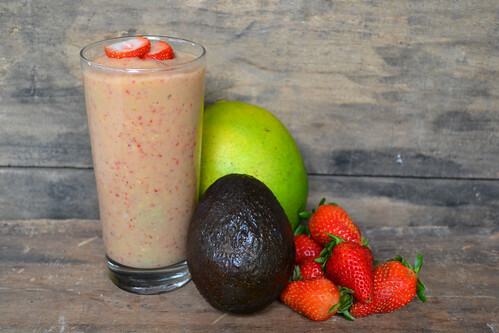 This smoothie with mango, avocado, strawberries and apple juice is super filling and a delicious breakfast. 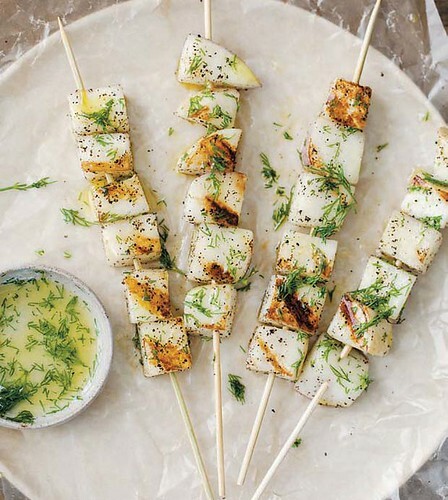 We love making this when we have to run out the door and need something to hold us over until lunch. Place all the ingredients in a blender or food processor and mix until combined. Add more apple juice depending on your smoothie thickness preference (more apple juice will help thin the smoothie out and make it easier to sip through a straw). 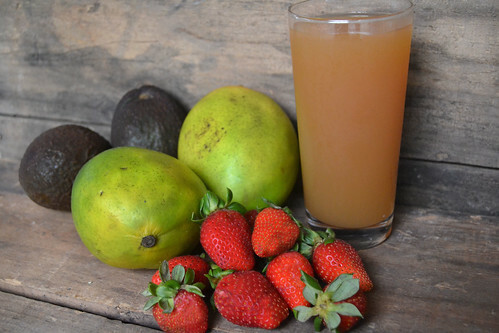 How To Add Fruits and Apple Juice To Your Delivery: CSA members - head on over to our online Farm Stand Market to customize your upcoming delivery. On the second page of customizations, you’ll find “Produce by the Case” and can stock up if you want a larger batch of produce for juices and smoothies. The Market is open from noon on Thursday until 10 am, 2 days before your scheduled delivery day. After you confirm your produce items, click the orange button "Confirm and Continue To Other Farm Products" to add the products to your delivery. You'll find the Solana Gold apple juice on the second page, "Other Farm Products," and can add it to your delivery if you choose.